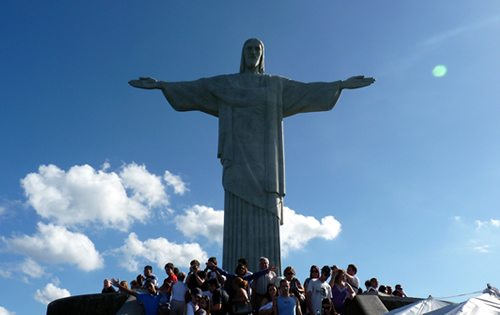 This Hiking Tour of Rio de Janeiro concentrates on seeing the city and its major attractions purely on foot. Copacabana and Ipanema Beaches, the Rodrigo de Freitas Lagoon, Sugar Loaf Mountain, Tijuca Peak, the statue of Christ the Redeemer on Corcovado Mountain, Pedra da Gavea and the marvellous Telegrafo peak are all within the city. 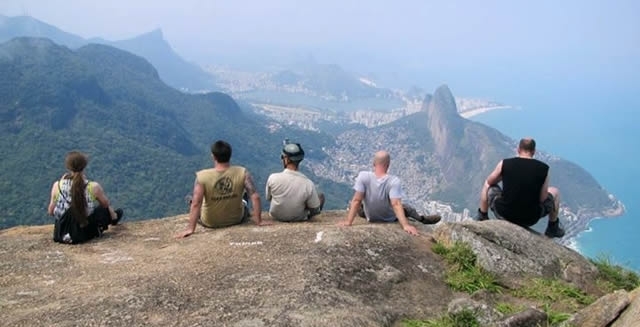 This Rio de Janeiro Hiking Tour takes you on the best of many trails to the peaks and hidden beaches in the city. Combines With: Buenos Aires; Buzios; Paraty & Ilha Grande; Sao Paulo; Petropolis to Teresopolis Trek. Your Rio de Janeiro Hiking Tour begins on arrival in the city, where you will be met by your Brazil Adventure Tours guide who describes the Marvellous City to you during the journey to your hotel. After checking in, you head out for your first hike to the top of Dois Irmaos, the mountains overlooking Ipanema Beach. The hike begins in the Vidigal Favela, a fascinating mix of scenery and the unique culture of Rio's poorest mountain-side neighbourhoods, before taking you up through vegetation to the rocky peak. The views over the neighbouring Rocinha Favela, Leblon and Ipanema Beaches, the lagoon and up to Cristo are stunning and a spectacular start to your time in Rio. 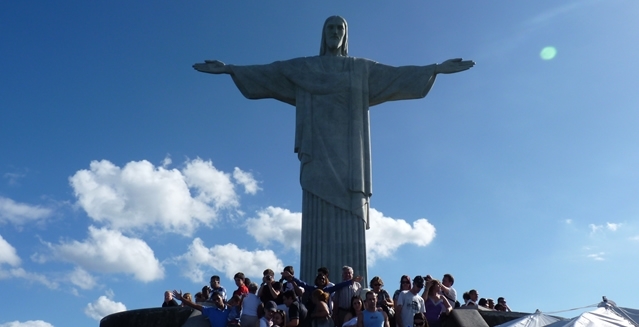 After breakfast, you drive up to the cool air of the Floresta de Tijuca, where the iconic statue of Christ the Redeemer overlooks Rio from the top of the Corcovado mountain. The 360˚ city views are matched by those from the top of Tijuca Peak, the highest mountain in the forest. The summit is reached by a two-hour trail through the rainforest until you climb the peak. The city, Guanabara Bay, Sugar Loaf, the Rodrigo de Freitas Lagoon and the beaches ringing Rio are all visible on clear days. After returning for lunch, you can enjoy the afternoon on Copacabana or Ipanema Beach. The evening can include a trip to Lapa, to experience the live music in Rio's best samba clubs. 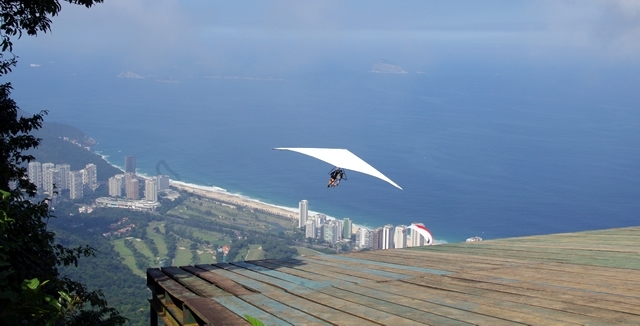 Today you make your own way to the top of another of iconic mountain in Rio. You head first to Praia Vermelha, the beach base of the cable car station that takes you to the top of Sugar Loaf Mountain. Instead of taking the easy way up, you circle Urca & Sugar Loaf rocks along a 2hr trail. The final section is the short climb of 25m/80ft up the granite and can be done by beginners of reasonable fitness. Enjoying the views from Sugar Loaf having just climbed it is the most satisfying way to visit one of Rio's postcard places. A trail lunch with monkeys wanting to share it with you is the perfect end to your day, and you have plenty of time in the afternoon to enjoy the beaches. 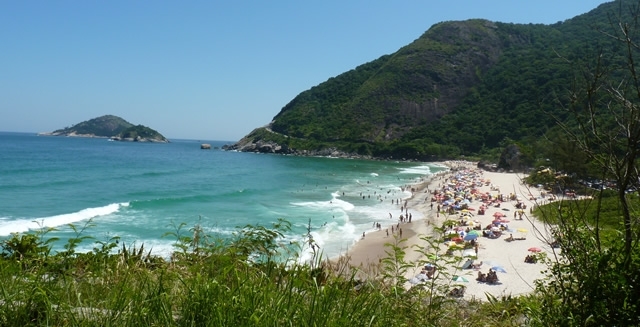 A day out along the coast takes you driving through Sao Conrado to Barra da Tijuca, the longest beach in Rio. Prainha and Grumari are two wild beaches at the edge of the city, hemmed in by mountains and rainforest. In Guaratiba you start the trail around the headland to Perigosinho and Meio, small beaches only reachable by trail or boat. You could also rapel from the Tartaruga rock here, before climbing up the 354m to the top of Pedra do Telegrafo, which has stunning views and photo opportunities looking back to Rio and down the Costa Verde. Before lunch overlooking Prainha, you could also hike another steep trail to Morro dos Cabritos directly above! A short drive around to Barra de Tijuca takes you under the shadow of Pedra da Gavea, the largest coastal monolith on earth. The trail takes you up through the forest for 2-3hrs before you come out under the Emperor, the iconic rock-face of Gavea! 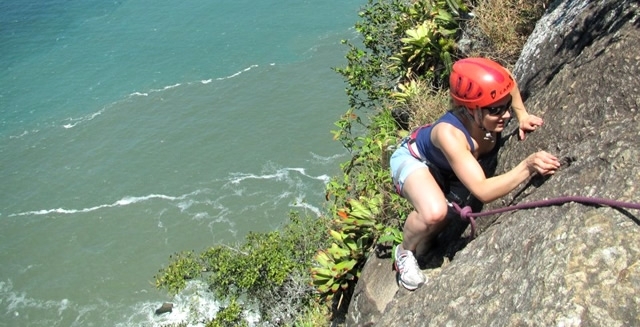 A climb of around 40m with safety equipment and the expert eye of your guide to help if necessary, and another half hour of trail take you to the top of the mountain, with a sheer drop to the Atlantic Ocean and views along to Ipanema Beach and all the way down Barra da Tijuca Beach. The same trail takes you back down to the city below and you return to your hotel. Alternative trails, climbing routes and kayak trips are all possible too. Day 6 : Flying Home from Rio! 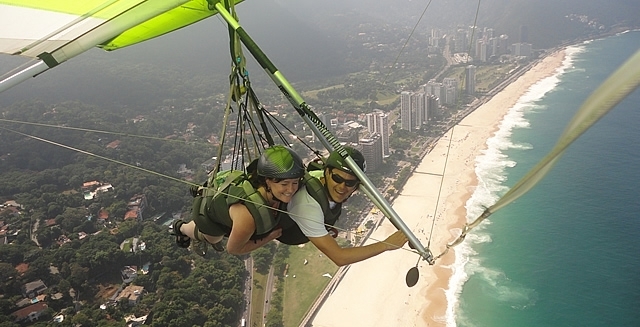 One of the most spectacular activities in Rio or any other city is to hang-glide from Pedra Bonita Mountain to land on the beach. Your tandem flight is in the safe hands of our professional instructors, who give you a safety briefing including take-off and landing. No prior experience is necessary, just a little courage! The 15min flight soars between the mountains and over the urban forest and circles out over the Atlantic waves before finally landing on the sands of Praia Pepino in Sao Conrado. The most memorable activity in Rio can be done on your final day, although usually better earlier in your stay to give us chance to rearrange in case of unfavourable weather conditions.